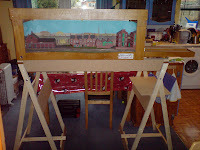 They include some very flattering photo's of Awngate, better than many of my efforts! Well I got there in the end! 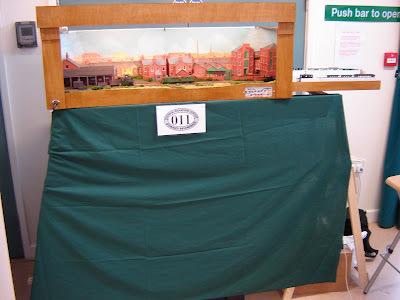 After a few frantic days and a couple of late evenings getting everything ready, the layout up to a reasonable standard, the stock in good shape with the right couplings fitted, and the loco's serviced and tested, the day finally arived for Awngate's first public appearance! The trestles worked well, and were tidied up with a drape as you can see below. The trains performed well, but the uncoupling was a bit hit-and-miss. I got some more magnets to try. Other than that the only problem was a point failure - the blade came loose, but I managed to get it back in place and super-glue it. 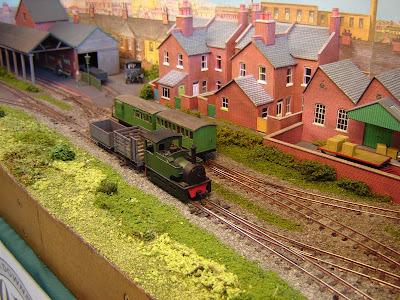 Lots of people made nice comments, and there was a lot of interest in the fiddle yard! My friend Steve helped out with the operating, getting very engrossed in the shunting (see second picture) - thanks Steve. 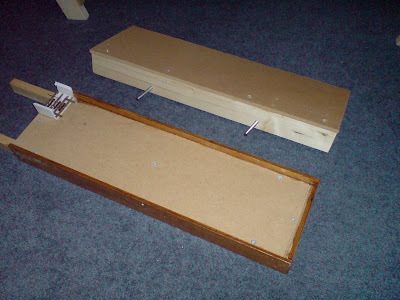 Finally I got around to making the layout support trestles. 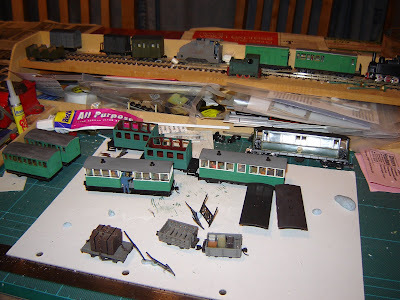 This is something I have given a lot of thought to, as I wanted a support system that could be used for future layouts as well as this one. 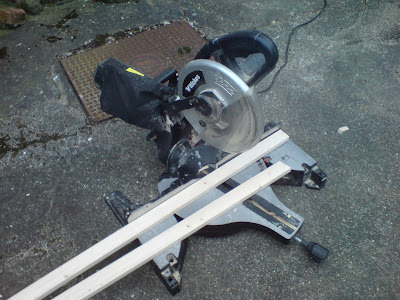 It has to be stable, easy to transport and errect, and capable of being built by me, as my carpentry skills are no more than average at best! So I came up with a plan for two trestles, with two "beams" between them to support the layout. 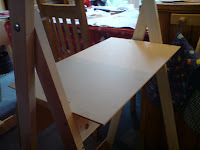 Made from approx 2"x1" (44x21mm) planed timber, with some 3"x1" and MDF, the legs pivot into each other using a bolt, and are held apart by a hinged beam hooked onto a screw. Simple, but it seems effective. Hopefully the photo's make clear how they work and how I made them. Assembling the legs. I always use posidrive screws, drill a pilot hole and countersink. Powertools rule! 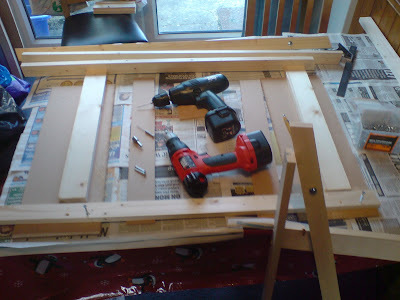 The MDF was glued with no-more-nails too. 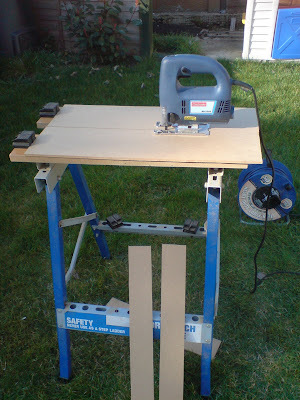 MDF was cut outside with a power jigsaw. 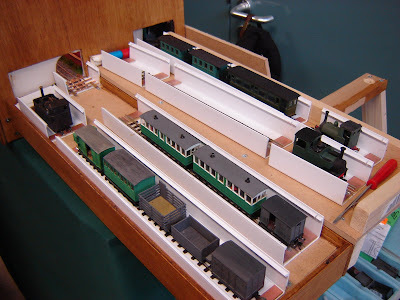 As well as the layout supports, I made a bolt-on shelf for the back of the fiddle yard. 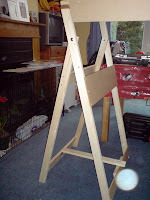 The design of the trestles is quite simple, seems pretty stable though. They are about 2' (60cm) wide, open to about 20" (50cm), and are about 43" (110cm) tall. This gives a reasonable viewing height for the track. 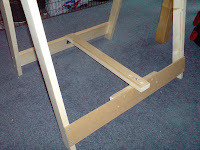 The legs assempled with the support beams, and the layout on top, note the shelf on the right-hand trestle. The beams are 4'4" (13ocm) long, so with some overhang they could support a layout up to 6' or 7' (about 2m) long. 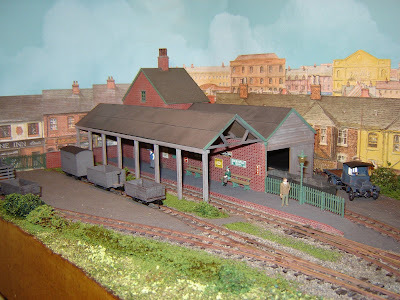 The layout just sits on the beams, with the fiddle-yard overhanging to the right. 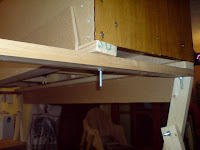 The top of the trestle, with the rear beam (MDF strengthener upward) and front beam (MDF downward) bolted in place. 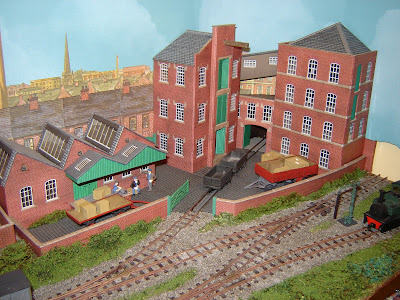 Obviously they can be bolted anywhere to the trestle to suit different widths of layout, here the layout is only half the depth of the trestle. The MDF rib stops the layout sliding off. 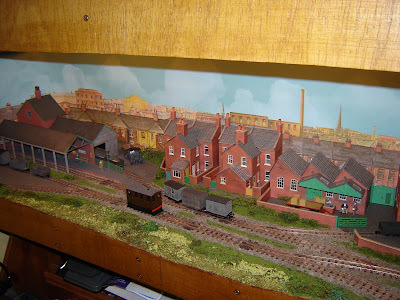 In theory the layout could be levelled by adding washers or packing between the beams and the top of the trestle.